Bro John Hoever and the Franciscan Brothers, Congregation of the Brothers of the Poor of St. Francis of Assisi. Philip Martin Hoever founded the Brothers of the Poor of St. Francis on Christmas Eve in 1857 through the inspiration of the Holy Spirit and with the strong support of Blessed Frances Schervier, foundress of the Sisters of the Poor of St. Francis. 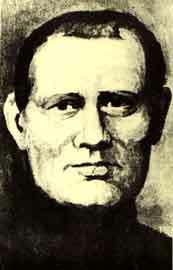 Under the leadership of Philip Hoever, known in religion as Brother John, and under the watchful eye and guidance of diocesan clergy, plus continued intercessory prayer to St. Joseph, the young Catholic religious Community grew rapidly and spread from its cradle in Aachen to other parts of Germany. Brother John was born into a hard working farm family in the hill country of Neuhonrath, Germany. Although his help was needed on the farm, the local parish priest saw potential in the young Hoever and encouraged his eagerness to learn. This encouragement yielded in time a brilliant, dedicated, and successful schoolteacher. During the early years of his career, he met and later married Anna Maria Katherine Zimmermann and from this union came two boys, one of which became a Jesuit priest and author while the other, a successful politician. At a very early age, the boys and their father lost their mother and spouse due to a sudden death. Philip took solace in the work of the St. Vincent de Paul Society and the Secular Third Order of St. Francis. It was in the latter, that he became acquainted with Ms. Schervier, who would eventually alter the course of his life. The other members of the Third Order would later join Philip Hoever on that memorable Christmas Eve in 1857 as they knelt before the manger scene and pledged themselves as a group of Franciscan Brothers. Over the course of time, concerns of his young Brotherhood, his teaching career, and the welfare of his two boys brought a decline in his health. Sensing that his death lay in the not too distant future, he turned the leadership of this young diocesan Community over to Brother Bonaventura Schaeben. With the death of the founder, 13 July 1864, it was evident that the correct choice had been made to lead the Community forward. Under his diligent leadership the young Community grew and prospered even to reaching out across the Atlantic. Later, in 1910, while under the leadership of Brother Athanasius Wietmann, the Congregation gained Papal status. Today, the Catholic religious Congregation of the Brothers of the Poor of St. Francis has ministry sites in Germany, Belgium and in Brazil and in the United States. The words of the prophet Micah might well be applied to our Congregation: “You, Bethlehem-Ephrathah, too small to be among the clans of Judah... for through you His greatness shall reach to the ends of the earth...” for thus, the Catholic religious vocation of the Brothers of the Poor of St. Francis, though small in number continues to reach out and touch the lives of many neglected people in society through its varied ministries utilizing the gifts and talents of its membership. Our beloved founder, Brother John Hoever, encouraged his Brothers to be “Instruments of His Kingdom when and where He chooses,” so, we pray this admonition may carry us on into a future full of hope and promise. Are you interested in becoming a part of the Catholic religious vocation that the Brothers celebrate on Christmas Eve each year? If so, please phone (513) 924 - 0111. Brother John Hoever shared a Catholic religious vocation with the Brothers. You may wish to share this also. Please phone (513) 924 - 0111. 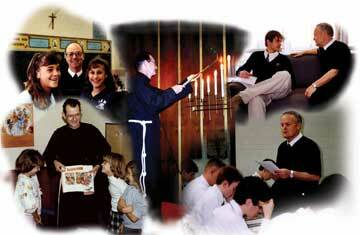 Brother John Hoever led a contemplative life.